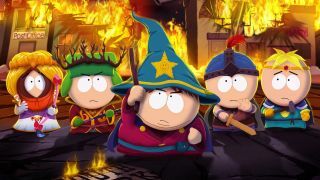 After its original last gen release and being bundled with South Park: The Fractured But Whole on PS4 and Xbox One, South Park: The Stick of Truth has now made it onto Nintendo Switch - allowing a new group of players to revisit the New Kid's original adventure, either at home or while on the go. The Stick of Truth is much more demanding that its sequel when it comes to the various collectibles, hiding many of them within specific story quests which makes them highly missable, so if you're attempting to grab every trophy or achievement then you need to know what you're looking for along the way. That's where our guides come in, as we'll show you where to find every hidden item, and ensure your collection is complete. If you're looking for help with South Park: The Stick of Truth then this is the place to be. We've spent countless hours combing the game and locating every hidden collectible to make sure you don't miss any, as well as finding all the locations you need to complete every difficult side quest along the way. As you work your way through the story, there are a full 120 people to befriend on the game's version of social media, either by talking to them or completing certain tasks. Some of them can only be added during specific story quests, and if you miss them then you won't be able to earn the More Popular Than John Lennon trophy/achievement, so make sure you follow our South Park: The Stick of Truth Friends locations guide. There's no prize for guessing which franchise South Park's Chinpokomon is sending up, but there is the Chinpokolypse trophy/achievement available for collecting all 30 of the unusual critters. Again, some of them can only be found during specific story quests, so check out our South Park: The Stick of Truth Chinpokomon locations guide if you want to catch them all. If you want to look good and stay well armed while on your adventures, you'll need to track down the best costumes and weapons in South Park. Furthermore, if you want to unlock the Clothes Whore and Full Arsenal trophies or achievements then you'll need to locate all 100+ items, and - you guessed it - there are plenty of them which can only be picked up during specific story quests. Slip in to our South Park: The Stick of Truth Costumes and Weapons equipment locations guide, and ensure you don't miss any. Whether it's hunting big game with Jimbo, playing hide and seek with kindergartners, or unlocking fast travel flags with Timmy, there are plenty of side quests dotted around South Park which involve finding items or locations that aren't marked on your map. Helpfully, our South Park: The Stick of Truth side quests guide has done the legwork of finding them, so you don't have to. Looking for more South Park? Here's our pick of the best South Park episodes (so far) - is your favourite in there?